UFOs Recorded Over San Miguel Volcano? A series of unexplained lights have been filmed hovering over a volcano in Central America. 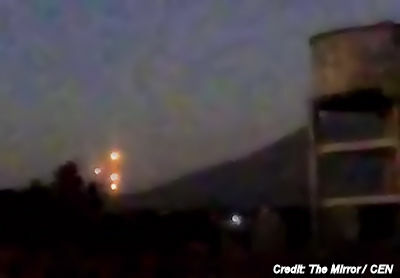 The video, taken in the foothills of San Miguel volcano in eastern El Salvador, show the lights seemingly moving together on their own. Social media users first reported the sighting of the four large lights at the bottom of the famous volcano, which last erupted in 2013. And some even believe it's proof that aliens exist after claiming they were UFOs .